Accessorise your look with contemporary New York chic, with this sleek DKNY stainless steel crossover bangle watch with a modern square case and simple fresh silver tone dial. 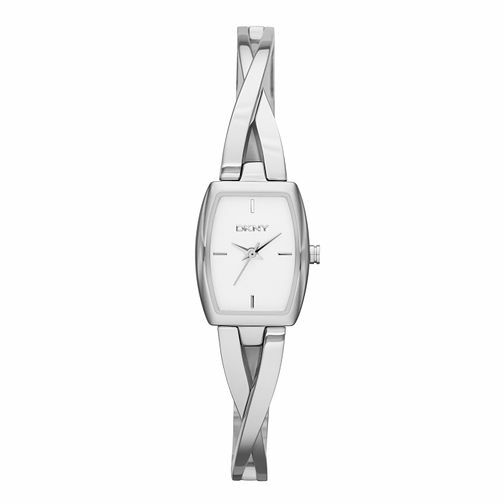 Dkny Ladies' Stainless Steel Crossover Bangle Watch is rated 5.0 out of 5 by 1. Rated 5 out of 5 by Anonymous from Good quality/good looking I chose this watch for my wife for Christmas because it looked great. She needed a watch, and while she's not particularly in to her big names, DKNY in this instance, this watch looked too good to pass by. She loves it too. The links on the strap pop out to adjust size (though the Ernest Jones lady did it for her anyway). Well made too.